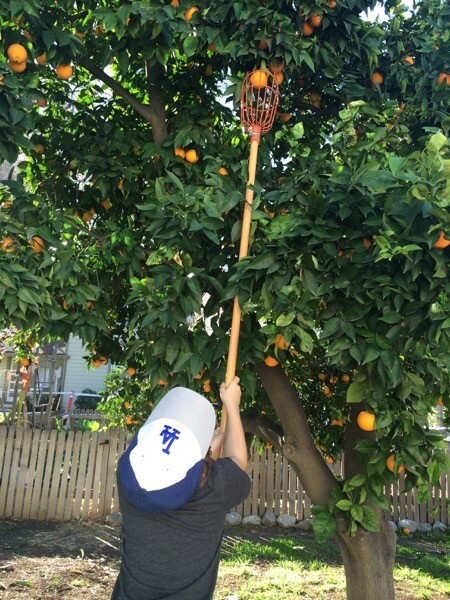 When it’s January in Southern California, there’s no time for post-holiday blues because the orange season is underway and it’s time to get pickin’! You’ve gotta reach up with the picking pole to get the good ones! 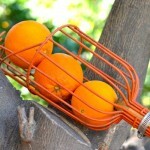 One of our favorite places to pick oranges is at Heritage Park in La Verne, CA. 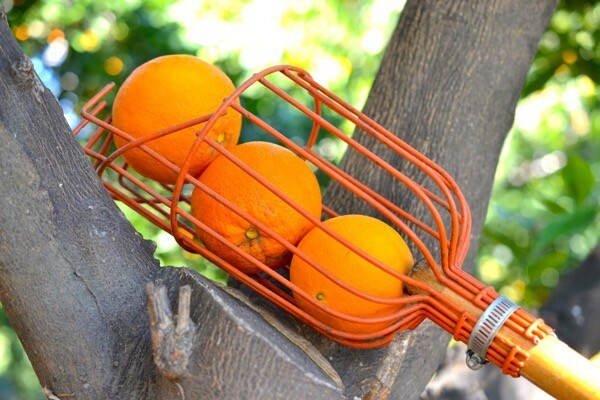 While many of California’s small orange groves have been sold off and repurposed, the orange grove at Heritage Park has been lovingly preserved by the La Verne Heritage Foundation. Onsite is an 1800s farmhouse and barn, surrounded by 1 1/2 acres of citrus trees. You can go there on Saturday mornings to pick oranges and grapefruit, and while you’re there you can take a tour of the frozen-in-time farmhouse (and gawk at the seemingly ancient cooking implements in the kitchen). Three just-picked oranges resting in the picking pole. 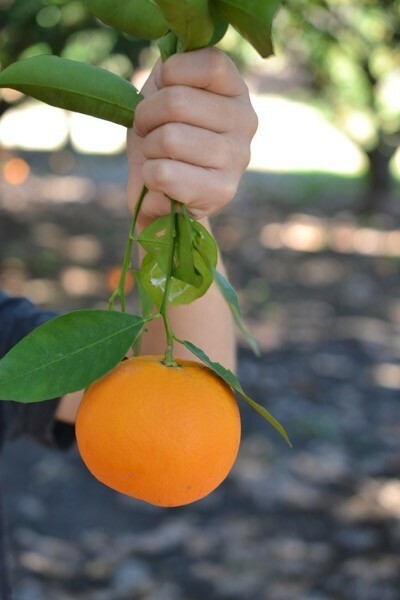 At Heritage Park, there are navel and Valencia oranges available for picking. 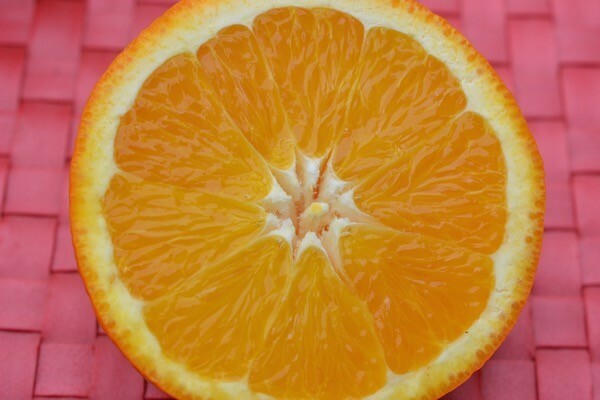 Navel oranges are a delicious sweet snacking orange, while Valencias are extra-juicy and perfect for juicing. 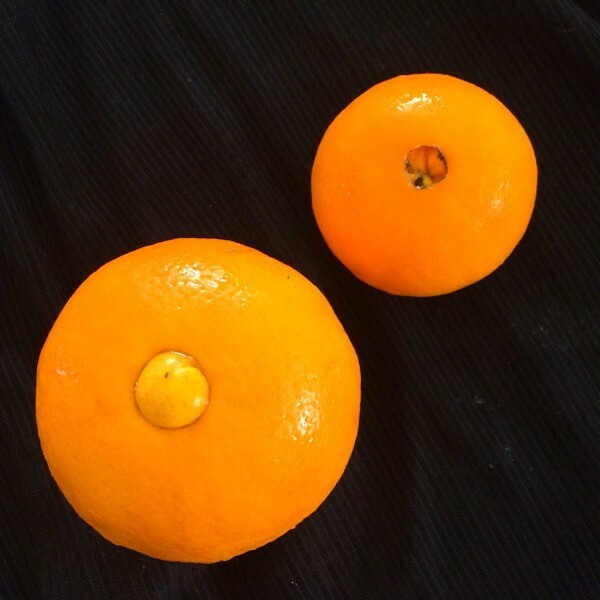 Side note: Did you know that the “navel” on a navel orange could be an “innie” or an “outie”? 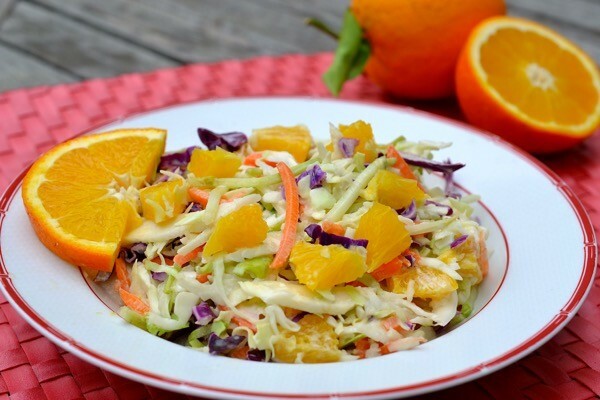 What we’ve done with our navel oranges here is add them into an easy coleslaw. We’ve also made the coleslaw a little extra-orangey by adding orange juice to the dressing. The result is a bright, sweet and tart coleslaw that’ll give you just a little extra spring in your step, whether it’s sunny and 72… or snowing outside. This orange coleslaw is sweet-tart and will brighten up any meal. In a small mixing bowl, combine the mayonnaise, cider vinegar, orange juice, sugars, and salt. Mix well until thoroughly combined. In a large salad bowl, place the coleslaw mix and orange pieces. Add the dressing and stir to combine. Chill until ready to serve. Optional: Garnish with additional orange slices. Note: An easy way to prepare the oranges is to cut them into slices, cut each slice in half-moon shapes, and then gently remove the peel. Then you can separate the segments of the peeled orange slices. This post made me miss SoCal. Born and raised there. I spent many hours picking oranges off my own trees in my back yard (along with other fruits) and at my grandparents. I also miss the sunshine. This slaw looks so fresh and yummy! Never heard of Heritage Park, even though I grew up in Upland, next door to La Verne. 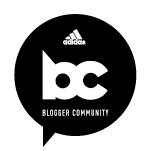 Hmmmm…must remedy that! Yes – you should! Such a fun day trip!